Double Minds begins with Parker James struggling to succeed in the Nashville music scene. She finds the competition fierce maybe even deadly. Nothing is as it appears, and unraveling the truth challenges everything Parker believes about her talent, her future, and her faith. Dr. Anthony Pattin, a favorite performer for BPL, will give a special concert on Thursday, February 19, 2009. Dr. Pattin will play in the BPL-Central Atrium on a baby grand piano especially for this BPL@Night performance. He will play three different styles of music: one part classical, one part popular tunes, and another segment to be announced. Pattin has taught at the University of Montevallo since 1987. His intense enthusiasm for music and the piano began at an early age in his hometown of Toledo, Ohio, where his career was decided in high school when he was singled out to perform as a soloist in a concerto. He subsequently earned the bachelor and master of music from the Universities of Toledo and Michigan and the doctor of musical arts from the University of Alabama. Pattin has an extensive and diverse repertoire (including more than 30 concerti). He has performed in recitals throughout the United States, as well as in Central America, Europe, and Japan. He has appeared as soloist with the Alabama Symphony, the Toledo Symphony, the Arkansas Symphony, and the Abilene Philharmonic. Pattin has won numerous honors, including the coveted first place award in the International Bartók-Kabalevsky Competition (1988). His New York debut was in April 1998 at Carnegie Hall. 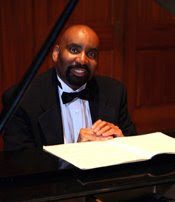 Winner of the 2008 BAMA Award (Birmingham Area Music Award), Dr. Pattin has recorded seven CDs, including With a Touch of Class, featuring requested hymn arrangements as well as standard concert pieces. Dr. Pattin will have CDs available for purchase at this special concert. 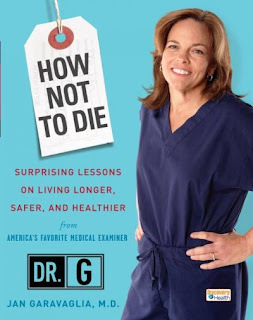 How Not To Die , by Dr. Jan Garavaglia, gives lessons on how to avoid premature death, as well as simple advice on how to live a much longer and healthier life. Dr. G is well-qualified to give us the answers. She is the chief medical examiner for the District Nine Examiner's Office in Orange County, Florida, and has presided over 1,100 autopsies each year. In addition, Jan Garavaglia is the host of Discovery Health channel's top-rated series, Dr G: Medical Examiner. We can learn from her expertise. In this informative, thought-provoking book, Dr. G blends case histories with advice and detailed examples. As forensic expert, Garavaglia must closely examine cell, tissue and fluid samples of deceased individuals to make her best determination as to the cause of death. She uses subtle clues, hidden evidence, and interviews from family members to pinpoint the exact cause of death. Some cases are difficult, but it is her responsibility to apply her knowledge and put together the pieces of the puzzle. She believes that genetics and luck partially determine our fate, but our choices largely determine how long we live. Therefore, by listening to advice and following a few precautions, we can avoid an early demise. Doctor's ties are colonizers of bacteria that can cause disease. The most dangerous hours to be on the road are Friday night and Saturday night between midnight and 3 a.m. Motorists and pedestrians face greater risks than airline travelers. More than 65% of all traffic collisions are influenced by an intersection. This book is a must read. We should all be concerned about how to improve our health and extend our life. Dr. G. finally cautions that we should above all listen to our body, practice good hygiene and remember what matters. Such simple advice can profoundly affect our longevity. Dr. Garvaglia finally states: "Life has its challenges at times, and death is inevitable. We just don't have to help it along." Fridays from 1969-1974, I watched America’s most wholesome stepfamily come together and merge, weathering the adolescent storms of braces, lost Kitty Carryall dolls, and battles for the coveted attic room. When you hear “Marcia! Marcia! Marcia!”; “pork chops and applesauce"; “Baton Rouge!”; and “Oh! My nose!”and you immediately think of the Bradys, then you were watching right along with me. In 1992 Barry Williams a.k.a. Greg Brady wrote Growing Up Brady, a very funny, self-deprecating look at his years on the set of The Brady Bunch. Maureen McCormick a.k.a. Marcia Brady just published Here’s the Story: Surviving Marcia Brady and Finding My True Voice, a brutally honest memoir of her life before and after The Brady Bunch. Unlike the Bradys, Maureen's home life was anything but idyllic. Her grandfather gave his wife syphilis, and she passed the disease to Maureen's mother at birth. It was a shameful secret all through her mother's life, and was the cause of her mother's agoraphobia and compulsive hoarding. The McCormick home was always filled with so much clutter that they were ashamed to invite people over. The All-American girl with the beaming smile and golden locks, Marcia was the envy of young girls all over the country. But the confident boy-magnet Marcia Brady was far removed from the self-conscious Maureen McCormick. Maureen was plagued with negative body images, and she spent the Brady shoot in Hawaii hiding behind beach towels to cover her "flabby" stomach. When shooting began each season, she would size up Eve Plumb's bosom, jealous that Eve might blossom before she did. From age 17 through her twenties, Maureen battled with bulimia in an effort to control her weight. After The Brady Bunch was cancelled, Maureen found it hard to shake Marcia loose, and she had trouble finding work as an actor. She started abusing drugs and could barely handle what little work she was getting. She had two unplanned pregnancies that ended in abortion. High on cocaine, she blew an interview with Steven Spielberg, who was casting the leading lady for Raiders of the Lost Ark. She went on a date with Steve Martin, but she blew that too when she was too stoned to react to his jokes. This is one of those reads that I was able to finish in two days. I think it's because I enjoyed the nostalgia of a favorite childhood TV show, but I also appreciated the frank way Maureen admitted to her mistakes and revealed her flaws in an effort to heal herself. Our beloved Marcia Brady is now 52-year-old and enjoys the support of her husband of 23 years and her 19-year-old daughter. John Updike, Pulitzer Prize-winning writer, passed away Tuesday, January 27th, at the age of 76, after a battle with lung cancer. He was an award-winning American novelist, poet, short story writer, essayist, literary critic and art critic. John Updike described his subject as "the American small town, Protestant middle class." The majority of his fiction was set in New England. He was a prolific writer, publishing more than 60 books, including twenty-five novels, over a dozen short story collections, as well as poetry, stories, reviews, children's books and literary criticism. Updike was a regular contributor to The New York Review of Books. He was known internationally for his rabbit series which includes Rabbit, Run (1960), Rabbit Redux (1971), Rabbit is Rich (1981), and Rabbit at Rest (1990). Updike won the Pulitzer Prize for two of his novels, Rabbit is Rich and Rabbit at Rest, as well as two National Book Awards. He was the third American to win a second Pulitzer Prize in the fiction category. John Updike was born in Reading, Pennsylvania. He was raised in the small town of Plowtown, Pennsylvania where he became interested in reading and writing. During his childhood, he lived on an isolated farm. His favorite books were mysteries, written by Ellery Queen, Agatha Christie and Erle Stanley Gardner. Updike later attended Harvard, majoring in English, contributing to and later editing the Harvard Lampoon. In 1955, he joined The New Yorker staff. By the age of 23, he was able to support himself by writing. He wrote The Couples (1968), The Witches of Eastwick (1984), and its sequel, The Widows of Eastwick (2008). The Centaur (1963) used mythology to explore the relationship between a schoolmaster and his son. Terrorist was Updike's 22nd novel, and concerned an 18 year old extremist who critiqued American culture. 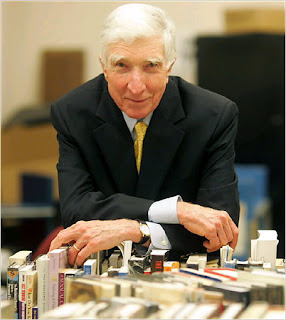 John Updike will be remembered as a major literary figure who wrote with beauty and passion about American middle class life. For more information, please visit the Literature Resource Center, a database containing biographies, bibliographies and critical analysis of more than 120,000 literary figures from all time periods. A JCLC library card is required for access. In the remarkable documentary Traces of the Trade: A Story from the Deep North, filmmaker Katrina Browne takes members of her family on a difficult journey of exploration to learn about their forefathers' role as the largest and wealthiest slave-trading family in American history. The film examines the place of slavery in the American experience, the role of wealthy New England traders like Browne's ancestors in perpetuating the slave trade and making it profitable, and the legacy of slavery for us today. Following the documentary viewing, Dain Perry will lead a facilitated discussion. Dain participated in the documentary along with his brother, Jim, and nephew, James. He grew up in Charleston, South Carolina. During the 1970s he worked for a non-profit agency that promoted reform in the criminal justice system, particularly prison reform. Dain has been a member of his church vestry and has been an active volunteer in his community for many years, including serving on the boards of several nonprofit organizations. For more information about the film and project, visit http://www.tracesofthetrade.org. Sponsored by the Birmingham Public Library and the Episcopal Commission on Race Relations in the Church. For appointments call 226-4000 beginning on Wednesday, January 21. Sessions will begin on Monday, February 2. Sessions will take place on Mondays and Fridays from 9:00 a.m.-2:30 p.m. Sponsored by AARP. Saturday, January 31, February 28, and March 28, from 9:00 a.m-12:00 p.m.
Wednesdays from 9:00 a.m.-12:00 p.m. by appointment only. For appointments call 836-3341. Sponsored by NRS Community Development Federal Credit Union. 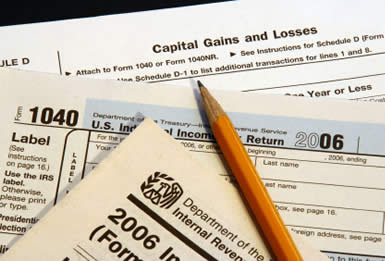 For appointments call 1-888-99-TAX-AL. Sessions will begin on Wednesday, January 21. Free income tax preparation and fast electronic filing for households earning less than $42,000/year with one or more kids or $20,000/year without kids. Sponsored by Youth First, Regions, SaveFirst, and Badham & Buck, LLC. 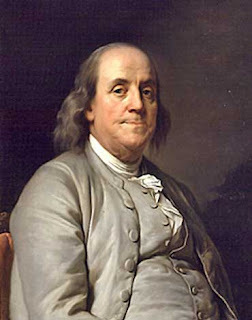 Benjamin Franklin was no Puritan, but he was also not as modern as we have made him out to be. Join Dr. Brian Steele, UAB Professor, as he explores what made Franklin a man of his time, an era on the cusp of modernity, but with one foot firmly planted in tradition. Wednesday, January 28, noon. After the winter holidays is when my mind is on clearing out the junk that accumulated in my house over the year. Well, it seems like Spencer’s mom has the same idea in Too Many Toys, written by David Shannon, creator of the hilarious Diaper Dave series. Kids today have way too many toys. It’s hard to appreciate any toy when they're underfoot in every room in the house. Let's hope for your sake that Spencer has more toys than the kids in your life. His toys cover the floor of his bedroom, are piled high in his closet, and are forming a trail down the stairs and into the living room. Spencer isn’t totally to blame. See, he gets toys from just about everyone he knows and for all occasions: his mom and dad, of course, but also his grandparents, aunts and uncles, friends, the dentist, the doctor, and even the teen slacker working the counter at the Kidburger. Sound familiar? When his mom and dad hop in pain from stepping on jacks and Legos in their bare feet, enough is enough. Spencer is told to pick through his toys and keep only the ones in good condition and that he still plays with. And with that, the littlest negotiator begins bargaining procedures. After much haggling a box is filled and ready to cart away. But wait! Why are there toys still scattered everywhere? And where is the box? Spencer discovers that you just can’t have too many toys—no matter what they're made out of! If you're interested in cleaning out the clutter in your life, check out some of these titles. 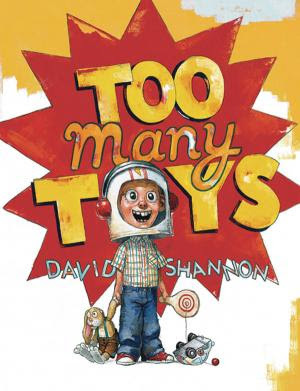 David Shannon reveals where he got the idea for Too Many Toys. The January edition of BPL@Night will feature the Liang Acrobatic & Comedy Show. 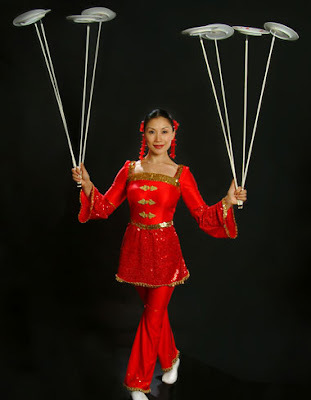 Liang, one of China's greatest acrobatic talents, is a native of Wuhan, China. She began studying dance, gymnastics, and acrobatics at the age of 4 with the world-renown Wuhan Acrobatic Troupe. Liang traveled the world with this group to venues in France, Germany, Switzerland, Israel, Indonesia, South Korea, and Malaysia. She was awarded two gold medals for excellence in international acrobatic competition in Paris and her native China. After arriving in the USA, she was immediately cast in a Justin Timberlake 'N Sync video. That video was shown on HBO as part of 'N Sync's live concert from New York's Madison Square Garden. Liang has also headlined at the House of Blues, appeared on MTV, ABC, NBC, FOX-TV, and performed at many NBA games. Most recently Liang has starred on NBC's #1 hit show, America's Got Talent and appeared on The Today Show. Liang loves to travel and perform with her husband, Bill. Together they've been seen in hundreds of shows nationwide. In the future Liang hopes to continue doing what she does best—meeting people and thrilling audiences everywhere with her incredible acrobatic feats. MC/comedian Bill Patti began his long show business career on radio and TV as an announcer. More recently he has performed as a voice-over talent on hundreds of commercials and videos nationwide. Now Bill brings his distinctive sense of humor to the Liang Acrobatic & Comedy Show. Bill is the quick-witted host who delivers his unique sense of humor, as audience volunteers become a part of this exciting and fun interactive experience. You will laugh out loud as you enjoy seeing your fellow audience members try their hands at becoming acrobats in this fun-filled part of the show. 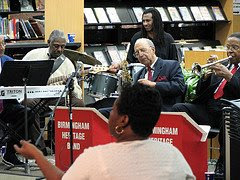 Baby, it's cold outside, but the Birmingham Heritage Band will be heating up the inside of the Springville Road Library tonight. Members of the Birmingham Heritage Band include Frank Adams, Tolton Rosser, Bill Harris, and Sherman Caesar, among others. Many of these members are seasoned veterans on the music scene, having played with some of the world’s jazz greats. All locations of the Birmingham Public Library will be closed January 19 to honor the birthday of Dr. Martin Luther King, Jr. Also, all BPL locations will be closed January 20 in celebration of the inauguration of the 44th president of the United States. Of course you can still visit BPL's virtual library at www.bplonline.org since it is always available, online and a click away. 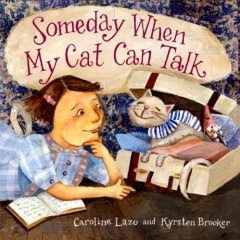 Caroline Lazo has written a fantasy about a young girl who imagines that her cat tells her incredible tales of travel to distant lands. Someday When My Cat Can Talk is a charming journey from England's coast, to France, Rome, Spain, Greece and Holland. This is a cat on a European vacation! that chased him into Rome. and the bird he met backstage. though locked inside her cage. The rhythmic verse is accompanied by whimsical illustrations showing the cat hopping aboard a ship and sailing away to visit England's coast, dining on mice living inside palace walls, wearing pointy heel shoes in France and relaxing in a gondola while touring Venice. The book contains tidbits of information that will inspire children to find out more about each country. Readers who love travel, and especially those who love cat tales will enjoy this colorful excursion to exotic countries! Youngsters will dream of visits to countries filled with beauty, drama and adventure. 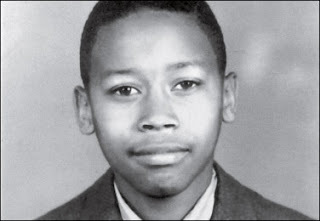 Virgil Ware, age 13, shot at random as he rode on the handlebars of his brother's bike by a white teenager on the same day as the infamous Sixteenth Street Baptist Church bombing . Dan Jordan, a retired Captain with the Jefferson County Sheriff's Department, will share his memories of Martin Luther King Jr. and the investigation into the murder of 13-year-old Virgil Ware. Wednesday, January 21, noon. Due to the library closing on January 20 for the inauguration of President-Elect Barack Obama, the Birmingham Public Library has rescheduled an important event. The BPL will host a book talk featuring The Autobiography of Benjamin Franklin with an appearance by Ben Franklin himself on Monday, January 26. Admission is free and light refreshments will be served. 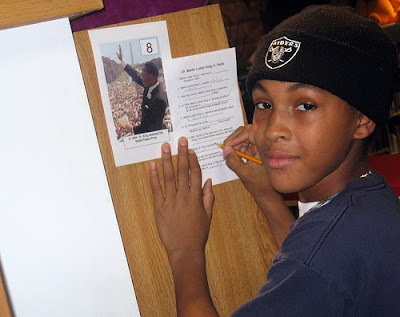 "I will be the first one to finish because I know the most about MLK." Children of all ages are invited to visit any Birmingham Public Library January 3–18 to participate in the Martin Luther King Jr. Scavenger Hunt. Preschoolers are encouraged to locate each of the ten hidden game pieces while older children are encouraged to locate the hidden game piece and complete the fill-in-the-blank activity. Each game piece includes a photo of Dr. King along with an interesting fact. Did you know that Dr. King was awarded the Nobel Peace Prize in 1964? Participants who successfully complete the scavenger hunt may enter their names into a drawing for a free book about Dr. Martin Luther King Jr. Each Birmingham Public Library will draw three winners. One of the give-away books is the award winning book, Martin’s Big Words: The Life of Dr. Martin Luther King Jr., written by Doreen Rappaport and illustrated by Bryan Collier. “Basics of Archives,” a practical, one-day workshop for those who work with historical records but have little or no archival training, will be presented at the Arrington Auditorium of the Birmingham Public Library in Birmingham, AL, on February 9, 2009. The all-day workshop will run from 10:00 a.m.-3:00 p.m. and will be led by Ben Petersen and Jim Baggett, department heads of the library’s Southern History and Archives Departments. In the workshop, participants will learn what makes historical records historical; how to take care of historical records so they are preserved and can be used in the future; how to protect historical collections from theft and destruction; where to find out more about caring for historical records, and much, much more. The Birmingham Public Library is sponsoring the workshop in collaboration with the Mid-Gulf Coast Continuing Education for Archivists Collaborative (MGCCEAC). The MGCCEAC received a three-year grant from The Institute for Library and Museum Services, a federal funding agency, to spearhead an effort to establish a sustainable program of good, accessible, and inexpensive continuing education opportunities for keepers of the historical record in Mississippi, Louisiana, and Alabama. Registration for the workshop costs $30.00 which includes all materials and a box lunch. To register, send your contact information and a check to “Birmingham Basics of Archives,” c/o Shugana Williams, Treasurer, Society of Mississippi Archivists, Katrina Research Center, The University of Southern Mississippi, 730 East Beach Blvd, Long Beach, MS 39560. There is limited seating, and registration closes February 1. If you have any questions, please call 226-3665. When browsing the Internet, there is no way to know what you will find. 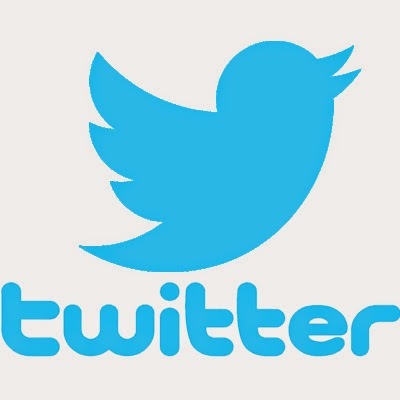 Want to find reliable information quickly? Use SuperSearch. SuperSearch is super fast, super smart, and super simple. The college football season is officially over. All I can say is "thank goodness for pro football!" The NFL season is winding down as well, but the playoffs will offer many hours of excitement before we get to enjoy the Super Bowl. Congratulations to the Florida Gators on winning their second national championship in 3 years. That makes the Southeastern Conference three-for-three in the national championship game. If you’d like to know what makes Urban Meyer tick, read his biography, Urban’s Way. If you’d like more insight into Southeastern Conference football, check out the new book SEC Football: 75 Years of Pride and Passion. You may also find some interesting items on the Subject Resources guide for Football. Just because the college football season is over, you don’t have to stop reading about it. When our unnamed narrator is recovering in a burn ward from a fiery car crash, his one constant visitor is one he doesn't know but who has known him...for 700 years. Her name is Marianne Engel and she is a patient at the hospital’s psych ward. Thus begins The Gargoyle by Andrew Davidson, a love story that moves from the present to the past as Marianne tells the story of how they first met at the Engelthal monastery in Germany. He was a mercenary brought to the monastery to die from burns and an arrow wound sustained in battle; she was a brilliant, young scribe who had been left abandoned as a baby on the monastery doorsteps. She immediately starts regaling him with stories of how they met, loved, sacrificed, and died. The present-day Marianne is a beautiful sculptress who frees gargoyles from blocks of stone because they call out to her. She takes the narrator into her home and nurses him back to health and sanity as she falls deeper into insanity. But is she insane? And did they really live other lives 700 years ago? The stories Marianne tells her lover to take his mind off his pain and self-loathing are like beautiful fables of another time, full of history and lore from Japan, Italy, England, and Iceland, and include characters that the narrator may or may not have the pleasure of meeting on a future fevered journey. What, you might think, has Marianne been doing for the past 700 years? She had 1,000 hearts from God to give away before the final meeting with her lover, who must accept her last heart so that she can finally be released from this world. It is up to the reader to decide if Marianne’s story is true or just the tall tales of a woman bent on destruction. The proof is scant: an unexplained childhood scar above the narrator’s heart and two ancient translations of Dante’s Inferno. Believe some of it, all of it, or none of it. Visit any Birmingham Public Library location January 12 through January 31 and register to win a free family four-pack of tickets to see Disney’s Imagination Movers live in concert at the Alabama Theater on Saturday, Feb. 7 at 3:00 p.m. In September 2008 Disney Channel debuted a new television series featuring Rich, Scott, Dave, and Smitty as blue-collar brainstormers working hard to solve “idea emergencies” in their Idea Warehouse, a clearinghouse of infinite inspirations. Through songs, stories and skits, Imagination Movers move kids to exercise their bodies and brains. Movers audio and video encourages kids to “reach high, think big, work hard and have fun!” The Movers themselves are leading by example as they captivate new fans daily with their winning sound and style. 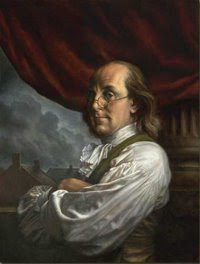 Join us as we explore the life and times of one of the best known of our Founding Fathers, Benjamin Franklin. Plan to visit the exhibit before or after the program. Wednesday, January 14, noon. 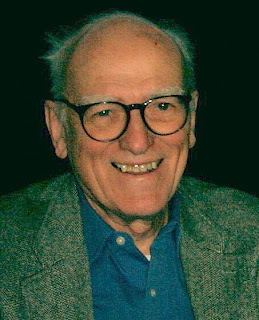 Mystery writer Donald Edwin Westlake, lauded as "master of comic capers" by The New York Times, died on New Year’s Eve at the age of 75. This successful author, specializing in crime fiction, has written over 100 books, five screenplays, and was the recipient of three Edgar Awards, the most prestigious award in the genre. In 1993, he was named Grand Master by the Mystery Writers of America. He won an Academy Award for a screenplay adaptation of The Grifters. Interestingly and surprisingly, these works were completed on manual typewriters. Donald Westlake was an American novelist, and was born on July 12, 1933 in Brooklyn, New York. He has written over 100 novels and non-fiction books during his career that lasted more than half a century. His books were characterized by quick dialogue, humor and fast-paced plots. He wrote under such pseudonyms as Richard Stark, Tucker Coe, Samuel Holt and Edwin West. His first novel, The Mercenaries, appeared in 1960. His most famous characters include Park, written under the pseudonym, Richard Stark, as well as the criminal character, John Dortmunder, appearing in the 1972 novel, Bank Shot. He produced five novels featuring Mitch Tobin, the unhappy investigator, under the pseudonym Tucker Coe. These books include Kinds of Love, Kinds of Death, Murder Among Children, Wax Apple, A Jade in Aries and Don't Lie To Me. He published 20 novels from 1962-1974 under his best known pseudonym Richard Stark, featuring the unrelenting thief, Parker. The majority of Westlake's novels were set in New York City. He will be greatly missed. His latest novel , Get Real , will be published in April 2009. If you are unable to find any of these books in the Jefferson County Public Library Catalog, you may be able to obtain them through Interlibrary Loan. Please visit the site for more information. Frazine Taylor will conduct a workshop on “African American Resources at the Alabama Department of Archives and History.” This workshop will be held in the Arrington Auditorium from 9:00 a.m.-2:00 p.m. There is a fee of five dollars and pre-registration in required. Please contact the Department of Southern History and Literature at 226-3665 to register. Frazine K. Taylor has over twenty years experience as a librarian, archivist, lecturer, and writer and has received numerous awards during her career including Employee of the Year from the Alabama State Employee Association. She is the Head of Reference for the Alabama Department of Archives and History (ADAH) and is an expert on Alabama records at ADAH. Ms. Taylor is a member of the Afro-American Historical and Genealogical Society and serves on the Editorial Board of the Journal of the Afro-American Historical and Genealogical Society. She is the President of the Elmore County Association of Black Heritage, Chair of the Black Heritage Council of the Alabama Historical Commission, a member of the Society of Alabama Archivists, and serves on the Board of Directors of the Alabama Historical Association. Ms. Taylor is the author of Researching African American Genealogy in Alabama: A Resource Guide (2008) and researched Tom Joyner’s and Linda Johnson Rice’s family roots and ties to Alabama for the PBS series, African American Lives 2.